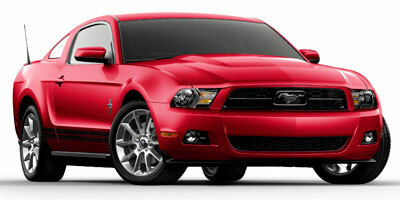 Despite last year’s overhaul, the 2011 Ford Mustang is generating quite a bit of buzz. Why? Because this year the Mustang is getting an upgrade where it counts – under the hood. And what an upgrade it is. In all honesty, the previous Mustang V-6 fell a bit short in the performance department. It was a bit of an archaic engine, measuring out at 4.0-liters but producing a paltry 210 horsepower and delivering 0-60 performance that wouldn’t make most hot hatches think twice. Not anymore, however. The new all-aluminum V-6 is a thoroughly modern powerplant, with twin independent variable camshaft timing that allows the engine to breathe more freely at all revs. The end result is 305 horsepower and, when combined with the all-new six-speed automatic transmission, an impressive 31 mpg highway. Not to mention, quite a burly V-6 howl. 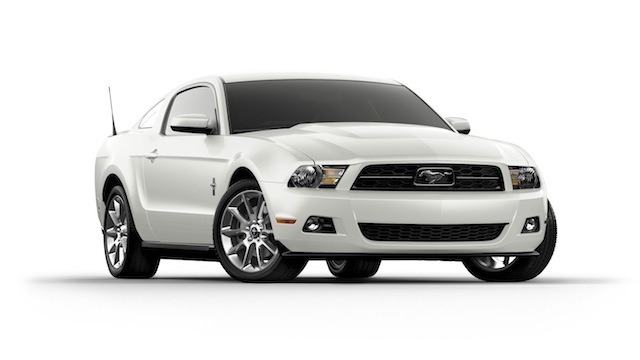 Suddenly, the proposition of a Mustang rental car is much, much more interesting. Finally, a V-6 Mustang that doesn’t make you spend every waking moment cursing the decision to not spring for a GT. The base price is quite low, technology options are very impressive and consumers have a choice between two rear-axle ratios depending on whether they prefer high fuel economy or quicker acceleration. 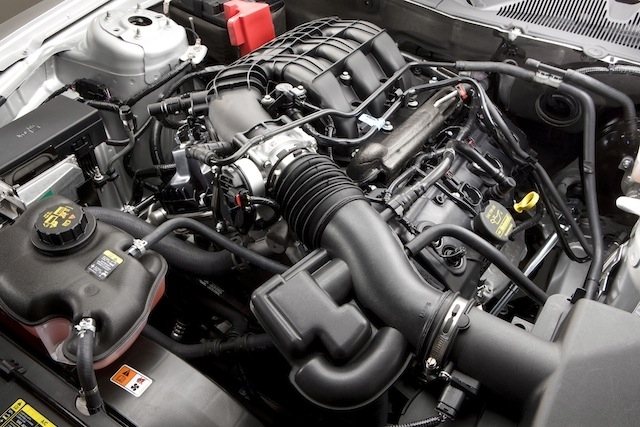 Take all the old stigmas associated with purchasing a V-6 Mustang and throw them in the nearest dumpster – the new 3.7-liter V-6 engine is a hard-hitter that likes to be driven in anger. Torque comes on strong above 3,500 rpm even with the standard car’s huge 2.73 final drive ratio, though those who like to get off the line quickly will be happy to hear that a shorter 3.31 final drive is available. There’s a proper mechanical howl that comes along with the 3.7-liter, especially in the mid-range, and the engine really coaxes you to rev it to 7,000 rpm. The springs are a bit soft for hard driving, and this condition manifests itself most on harsh, bumpy roads, where the suspension can have trouble keeping up with the constant changes in the road’s surface. The upside is a cushy, quiet ride on the highway, and those who want to hustle their Mustang will be glad to hear that the stiffer suspension of the GT can be ordered. Oh, and it even does some pretty convincing burnouts. Ford’s new all-aluminum V-6 is a real belter, putting out 305 horsepower at 6,500 rpm and 280 lb-ft of torque at 4,250 rpm, thanks in part to twin independent variable camshaft timing. Power is put to the ground through the rear wheels, via either a six-speed automatic or manual transmission. The Performance Package comes highly recommended to anyone who fancies hooning their Mustang. The package includes the stiffer suspension of the GT, 19-inch wheels with summer performance tires, a strut tower brace, recalibrated stability electronics and a 3.31 rear axle ratio for improved acceleration. 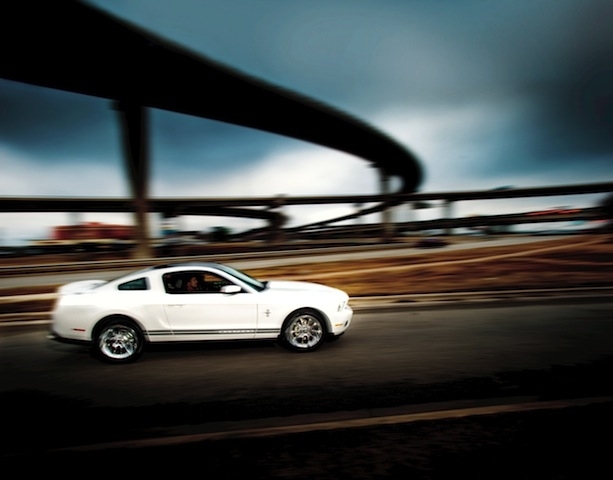 Ford is no stranger to technology, and the Mustang takes advantage of a host of high-tech goodies. Navigation, rearview camera, SYNC and Sirius satellite radio can all be added. The navigation system is easily the most impressive item, and in conjunction with conveniences such as live traffic, also has the capability to show sports scores, local gas prices and movie times. When it comes to fuel economy, the V-6 Mustang has nothing to be ashamed of. The automatic achieves 19 mpg in city driving but an astounding 31 mpg highway, while the manual returns the same city figure and 29 mpg highway. Both represent improvements over last year’s 18 mpg city, 26 mpg highway. Exterior changes from last year’s refresh aren’t too drastic, amounting to new headlamps, a slightly re-worked and more aerodynamic front-end and a new grille. Dual exhaust makes an appearance for the first time on the V-6 model. Concave mirrors have been added to the side mirrors to aid in blind-spot visibility, but can be a bit distracting. Pricing is key, and the Mustang nails the sweet spot, coming in at $22,995 including the $850 destination charge. That puts it right in line with cars like the $22,000 Hyundai Genesis Coupe 2.0T, $22,680 Chevrolet Camaro, $23,460 Dodge Challenger, and to a lesser extent, the $26,495 Mazda RX-8. Whereas it used to be relegated to “save up for the V-8â€ status, the 2011 Ford Mustang now stands tall as one of the best performance coupe bargains on the market, even when you factor in fuel economy. Spec the Performance Package and it becomes a real bruiser, too. The shame that used to be associated with purchasing a V-6 Mustang is no more.